Manzanita School’s curriculum has been carefully developed, and is built upon important new theories of adolescent development as well as research on best practices for education. As a new and dynamic approach to schooling, there are several important and interrelated components of our curricular orientation at Manzanita. What follows is a synopsis of the two primary elements of Symbiotic Learning. There is also an overview of our key instructional emphases in both Mathematics and Language Arts. In addition, you can read about our approach to creative arts, technology, and athletics in the downloadable library on the Experience page. At Manzanita, we practice Symbiotic Learning. This pedagogical approach is interdisciplinary, interest-driven, modeled on natural systems, and marked by periods of high engagement followed by reflective breaks. 1) Where have I come from? (2) Who am I? and (3) Where am I going? (1) biological-evolutionary (2) historical-cultural; and (3) aesthetic-numinous. (A more detailed explanation of the Three Questions and the Three Domains can be downloaded from the library below). 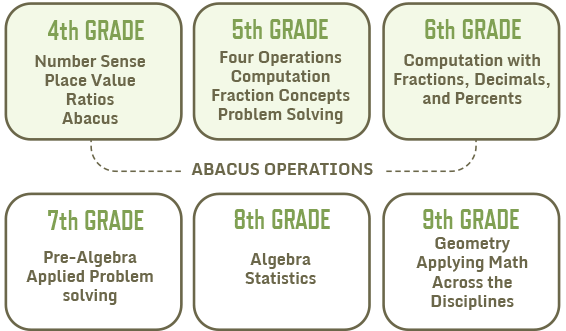 The following chart illustrates how select disciplines at Manzanita School are grouped under the Three Learning Domains. It also provides examples of three disciplines that cross through all three domains. 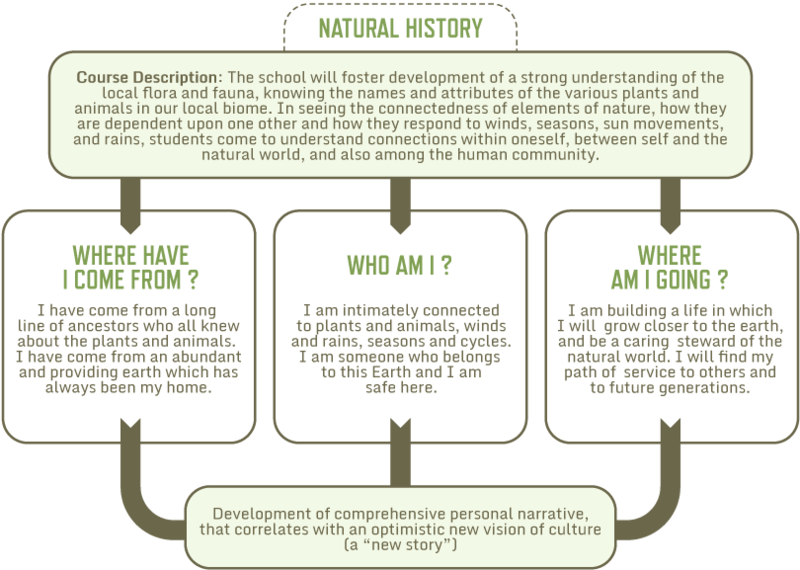 These two illustrations below show how our course in Natural History moves through the Three Central Questions, as well as the Three Learning Domains. Like several courses at Manzanita, Natural History is taught in all grade levels, with increasing levels of complexity. Comprehensive literacy successfully combines the skills of listening, speaking, reading, and writing. At Manzanita, we value and develop many different forms of literacy, including ecological literacy, scientific literacy, technological literacy, historical literacy, social literacy, and aesthetic literacy. At Manzanita School, we are committed to growing high levels of Language Arts competency in our students. Building these varied literacy skills are a vital part of developing and expressing one’s unique gifts, and for effectively engaging the tremendous issues in our the 21st century world. Mathematics requires, first and foremost, a well-developed number sense. Students who are able to understand quantities and who can conceptualize numeric correlations, are able to take these skills into actual situations in their lives. Mathematics is much more than solving equations; it is about building the spatial tools to see relationships and to visualize real problems. Math competency allows us to imagine solutions to the complexities of life and living systems. Mathematical skill is a way of seeing the world, and of framing possible paths and outcomes as one navigates life. 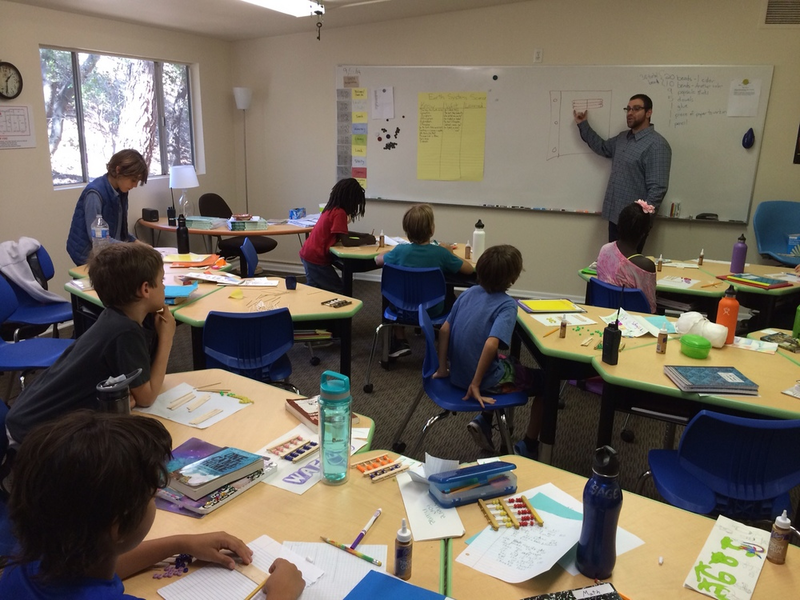 At Manzanita, we focus on the critical competencies of: strong number sense; facility with percents, fractions and decimals; conceptual problem solving; and algebra. The chart below shows the principle instructional emphases for mathematics by grade level. In addition to an interdisciplinary focus that seeks to answer central questions for the adolescent, Symbiotic Learning regularly cycles its content from the specific to the general and back again. We move from detailed facts of history, to examining vast stretches of human development over time. We consider detailed scientific content, then move outward to get a bird’s eye view of the general principles and laws of science. From the minutia to the ‘big picture’ and back again, learning at Manzanita becomes contextualized and comprehensible for our youth. PDF FILE: Further reading on the curricular elements. PDF FILE: Further reading on symbiotic learnings. PDF FILE: Further reading on the learning domain. PDF FILE: Further reading on the three central questions.